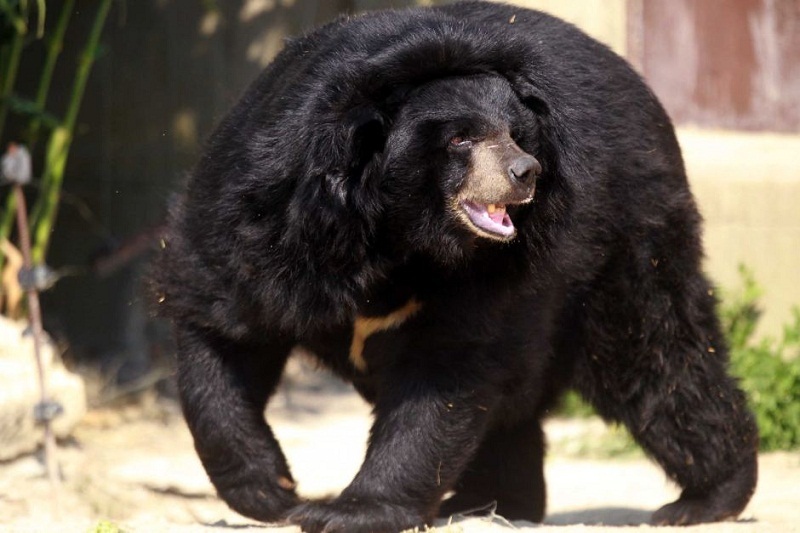 The Asian Black Bear, also known as the Moon Bear or Asiatic Bear, is a species of bear found in an extensive geographical range in the Asian continent. The population of this threatened species is diminishing at a regular pace mainly because of poaching and illegal hunting for making traditional medicine especially in China. Size: The head to tail length of the bear is 1.2 to 1.9 m.
Weight: Males can weigh anything between 60 and 200 kg, while the females are between 40 and 140. Body: The structure is medium but often hefty with loosely-folded skin. Fur or Hair Color: The coat is shaggy, rough, and is completely black (as their name suggests) except for the creamy white, angular to crescent-shaped mark on the chest. Head/Face: It has a long, light-brown muzzle, rounded ears, and eyes, with the characteristic fur around neck being exceptionally long and mane-like, and a strong dentition with rows of sharp teeth. Sexual Dimorphism: They do not exhibit any distinct differences between the sexes, except that the males tend to be larger and heavier. In captivity, the longevity of these bears is maximum 35 years, whereas in the wild, it is up to 25-30 years. 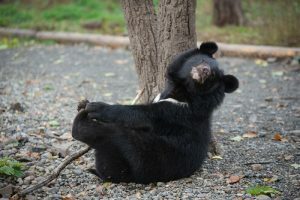 The range of the Asian black bears spreads across the Himalayas, in the northern parts of the Indian subcontinent, NE China, Korea, the Honshū and Shikoku islands of Japan, the Russian Far East, and Taiwan. 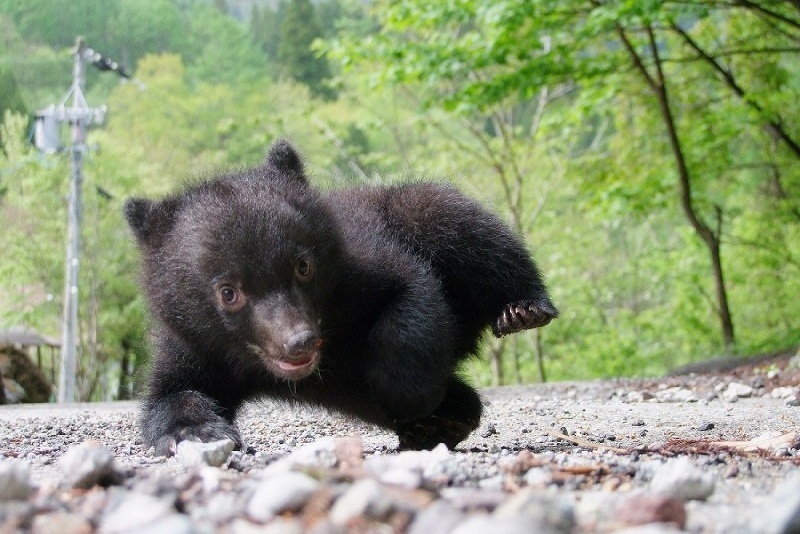 Moon bears seem to prefer moist forests, steep mountaintops, and areas with dense and thick vegetation. 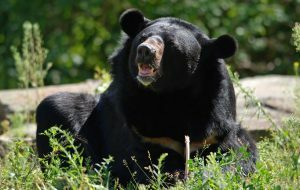 The Asian black bear has been classified under seven biological subspecies, depending on the size and regions. 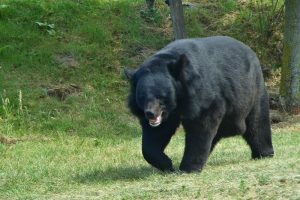 They are Himalayan black bear, Formosan black bear, Baluchistan or Pakistan black bear, Japanese black bear, Indochinese black bear, Tibetan black bear, and Ussuri black bear, with the last being the largest of them all. This species of bear are crepuscular, which means, they are more active during dawn and dusk. At night, they prefer sleeping on the treetop and often search for permanent shelters in the hollow trunks, as well as in the caves. They are excellent swimmers and climbers. They normally walk on all fours, but would usually stand on their hind legs while trying to reach food, or while fighting. During the winter months, they usually become less active like they are in the summer. Those that live in the colder or mountainous areas tend to hibernate between November and April, while the others migrate to lower and warmer altitudes. The adults of the species are usually solitary, living in large territories that can span between 6 and 10 km. However, it has also been noted that those living in nature reserves, where there is an absence of competition for food research, most of the individuals get adapted to living in groups. These mammals are extremely intelligent creatures, and communicate with each other using a range of sounds and vocalizations. They give out a pop-like call, as well as a kind of “tut-tut-tut”, especially when they find an approaching danger, or feel the urge to warn others. They have also been noted giving out snorts and screams out of rage before an attack or a fight. Like most other bear species, the moon bears too are omnivores, and feed upon a wide variety of plant and animal matters, though they seem to prefer a vegetarian diet. Their diet list includes mainly nuts in the autumn, and leaves, berries, fruit, shoots, roots, and even honey from the beehive at other times of the year. They will hunt mammals, fish, insects, and terrestrial worms, as well as eat carrion, if available. 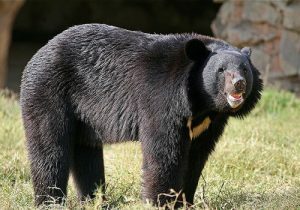 The mating season of the Asian black bear is between April and June. At the end of the gestation period of almost about a year, the female usually gives birth to a single puppy, but occasionally twins as well, during spring, usually between April and May of the following year. 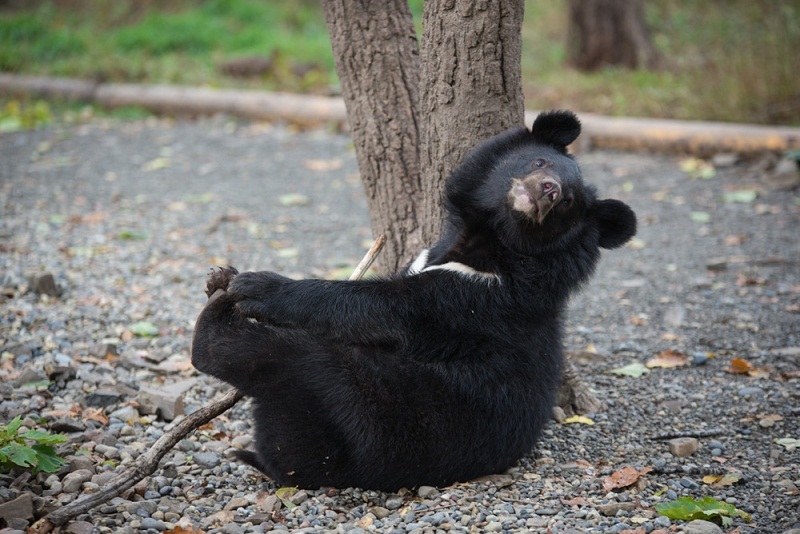 The offspring of the moon bear are weaned at 4-6 months. The young cubs, however, remain with their mothers for the first two years of their life. The juveniles take almost 3-4 years to attain the age of sexual maturity. During reproduction, a process called ‘late implant’ delays the development of the fertilized eggs inside the womb of the female so that the cubs are always born in spring. Thus, there will be an ample source of food for the mother for the production of milk. These arboreal creatures have very long, sharp claws that help them in climbing up the trees, where they mainly prefer to stay and sleep. Their primary enemy in the wild is the Siberian tiger that overlaps their range. Wolves and brown bears have also been reported to prey on cubs. 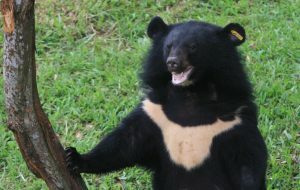 Considering their rapid decrease in population, the moon bears have been classified as ‘VU’ (Vulnerable) by the IUCN 3.1. Asian black bears can be very aggressive toward humans and is said to attack them even without provocation. The intensity of their aggression is said to be even more than brown bears of Eurasia and American black bears. It gets its nickname moon bear since the white mark on its chest reminds of a crescent moon.